The 120 feet long and 27 feet wide (beam) Okeanos Aggressor II the former Wind Dancer has been fully integrated into the Aggressor fleet. 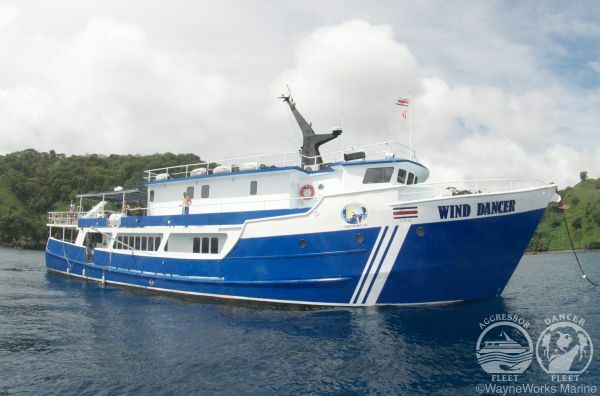 The vessel was built in 1990 and operated previously as a dive liveaboard vessel in the Caribbean. Mid 2012 she was moved to Puntarenas in Costa Rica to offer diving trips in Cocos island and from 2017 on to the Bat islands close to Playa de Coco in Costa Rica. The Okeanos Aggressor II is equipped with a spacious salon, covered and uncovered sun deck area, chaise lounges, deck chairs, bar, grill, and a complete photo center. The onboard video format is both NTSC and PAL. 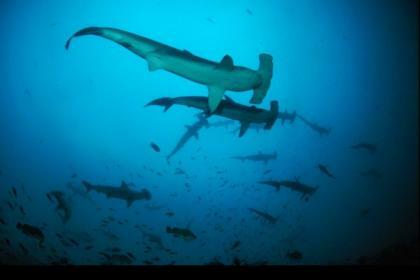 The diving liveaboard expeditions to Cocos island include 10 nights with 7 diving days and a few 8 nights trips with 5 diving days. This 35 meter Vessel offers 11 cabins for max. 22 Divers. 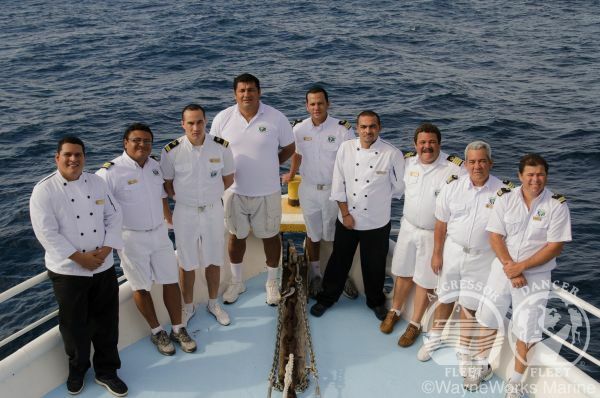 The crew consists in 9 members and they are all professionaly licensed and comply with the international SOLAS (International convention for the safety of life at sea) standards. 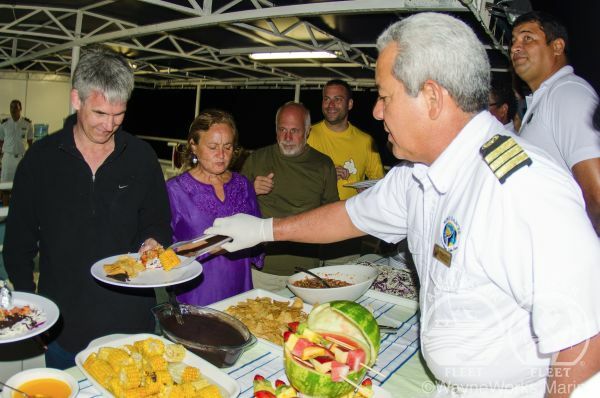 The menu on board of Okeanos is a mix of American style, barbacues and local central american cuisine. In the morning fresh fruits, hot entrees, cereals and juices are served. The lunch is buffet style with hot soups, bred made by the chef, salads and sandwiches and of course an entree. The dinner is prepared and served by the chef personaly and includes salads, vegetables, seafood, beef or chicken with dessert. Beverage wise water, tea, coffee, fruit juices and soft drinks are served on board. There is a limited selection of complementary local beer and wine. 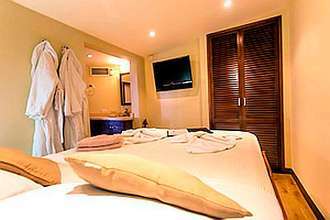 1 x two-person Master Stateroom, Main deck (Queen bed, larger size), 9 x two person deluxe stateroom with either twin or single bed located in the lower deck. 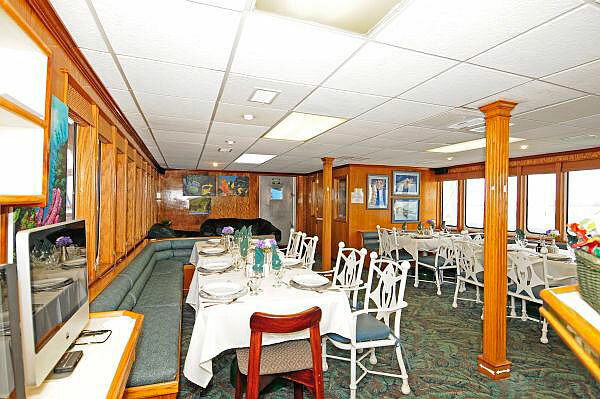 This spacious luxurious suite features 2 twin beds, picture window, bamboo wood flooring, a 42 inch flat screen TV with media player, private refrigerator and minibar, granite side table for dining in the cabin, wood panels, upholstered headboard, large bathroom with travertine floors, and separate glass enclosures for toilet and showers. 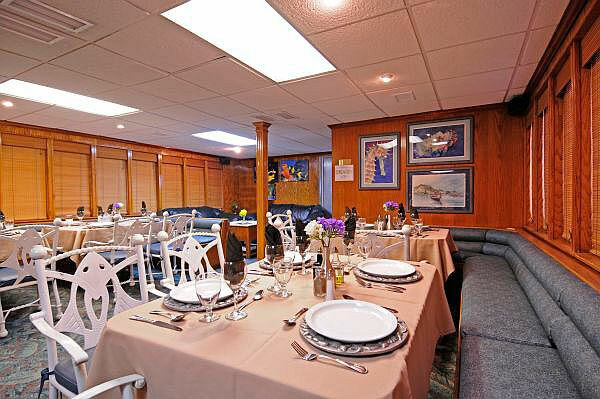 This spacious luxurious suite featuries a king bed, picture window, bamboo wood flooring, a 42 inch flat screen TV with media player, private refrigerator and minibar, granite side table for dining in the cabin, wood paneling, upholstered headboard, large bathroom with travertine floors, and separate glass enclosures for toilet and showers. 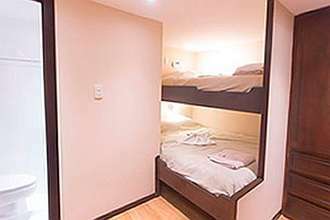 This 8 cabins located in the lower deck offer either double or twin beds in bunk-style, private facilities, cabinet with mirror, wardrobe, bathrobes, hairdryer, toiletries, every day fresh towels are delivered to the cabin. 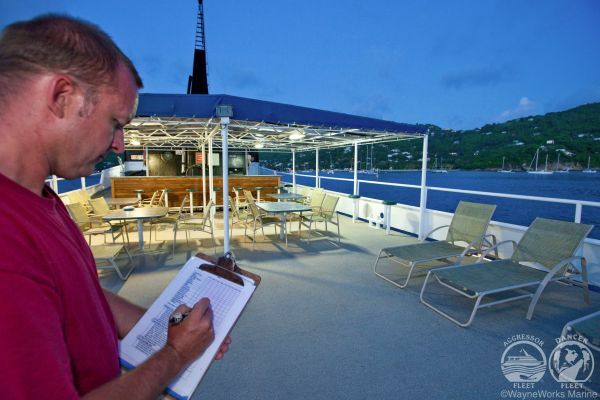 The large dive deck is equipped with a camera table and charging stations, freshwater showers and rinse tanks and offers plenty of space for your dive gear. Skiffs: 2 22 feet Zodiacs (pangas) hard bottom inflatables with outboard engine, each up to 11 Divers capacity. Tanks: 80 cu ft tanks with K valves, bring your DIN adapters if nesesary. There is a limited number of 15 liter tanks available. Technical Diving: unlimited Nitrox for USD 150 extra / 10 night Cocos trip. A full line of Aqua Lung rental gear is available aboard including regulators, BCs, dive computers, and night-lights. If any of your dive equipment fails while onboard, the crew will loan you equipment free of charge, compliments of Aqua Lung. The Okeanos Aggressor yachts offer a complete digital photo facility including a PC for downloading photos. The Photo pro is available for free coaching with equipment rental. Photo equipment is available to rent separately or as a complete set up. They have a strobe charging station and a large camera table available for your camera and video equipment. Guests should bring their own battery chargers. 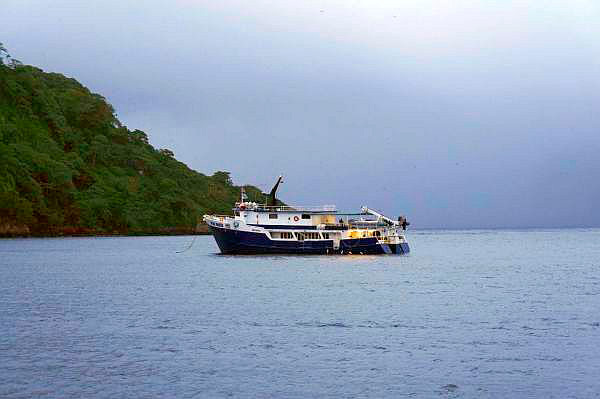 Day 1 – Meet in front of the hotel prior to pick up time and transfer to the Okeanos Aggressor I or II for boarding and departure for Cocos Island. 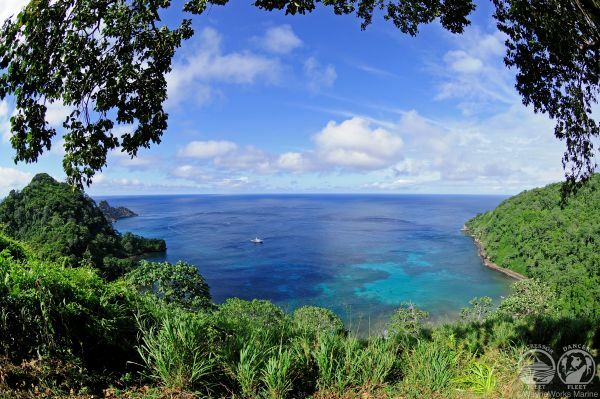 Day 2/3 – After 33 hours navigation over the Pacific ocean arrival to Cocos Island, diving begins. Day 11 – 7:00 am Check out and transfer to airport and host hotels. Check out at 7am, the crew will transport you to one of the host hotels, airport in San Jose, or, if you are not departing until the late afternoon we will have time to take advantage of the jungle crocodile safari or canopy tour. Departing flights should be scheduled after 12:30 p.m. Due to traffic, tides, etc. you will not be able to make an early morning departing flight.